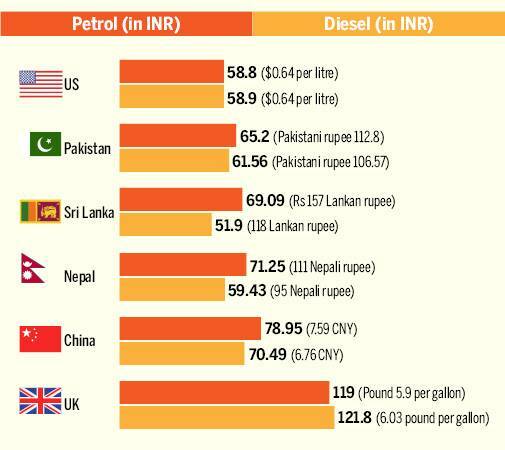 Petrol is expensive in India than most other countries! Crude oil is close to reaching $80 per barrel in the global market, and petrol prices are touching new highs here in India -- retailing at Rs 86.72 in Mumbai and Rs 79.31 in Delhi. While oil marketing companies kept the petrol and diesel prices unchanged on Wednesday, the prices are being hiked consecutively for the past 10 days. A spike in crude oil prices has been seen due to several global factors, including a cut in oil production and US sanctions against Iranian oil import. While the situation in India seems much worse -- with rupee breaching Rs 71.50 mark against dollar and fuel prices failing to show any sign of relief -- neighbouring countries like China, Nepal, Sri Lanka and Pakistan are also bearing the brunt of high crude oil prices, but still petrol is more expensive in India than most other countries. The US sanctions against Iran -- a prominent OPEC member and the third biggest exporter of oil to India -- make it difficult for its allies like India to manage the oil demand supply. US President Donald Trump has already threatened that "anyone doing business with Iran will not be doing business with the United States". Let's look at fuel prices in these countries, and the US and the UK. Petrol is being sold at Rs 53.88 per litre ($0.64 a litre) in the US while diesel at Rs 58.9 ($0.83 a litre). The country is one of the top oil-producing countries in the world. Fuel prices in the US are still lower than most of the European countries like the UK, the Netherlands, Amsterdam, Norway and Sweden. The country produces an average of 14.86 million barrel per day -- around 15.3 per cent of the world's total oil production -- compared to Saudi Arabia's (biggest OPEC producer) 12.39 million barrels a day. The petrol price stands at Rs 65.2 per litre in Pakistan (112.8 Pakistani rupee) while diesel at Rs 61.56 (Rs 106.57) per litre. New Pakistan Prime Minister Imran Khan last week announced a cut in petrol, diesel and kerosene oil prices to contain the rising inflation. Pakistan is facing the biggest battle of bringing the country's crumbling economy back on its track, but rising fuel prices may play spoilsport. Unlike India, fuel prices change on the 10th of every month in Sri Lanka. During last month's price update, petrol was priced at Rs 69.14 (157 Lankan rupee), while super diesel was priced at Rs 51.9 per litre (118 Lankan rupee) after Rs 2 and Rs 1 increase, respectively. The country recently introduced the monthly pricing formula to compensate the prices as per the global crude oil price variation. Petrol is available for Rs 71.25 (111 Nepali rupees) a litre in Nepal, while diesel is sold for Rs 59.43 (95 Nepali rupees). Just like India, the Nepali rupee, which is pegged with India's currency, is also not performing well against the dollar. While the Indian rupee slipped to 71.12 on Monday, the Nepali rupee touched Rs 113.83 against the USD. In the last four months, petrol and diesel prices shot up by Rs 5 and Rs 8 in the tiny nation. The latest numbers show that petrol price in China -- a nationwide average -- is Rs 78.95 (7.57 CNY). In Beijing, petrol was priced at Rs 70.49 (6.76 CNY), while diesel was priced at Rs 70.49 (6.76 CNY) on Monday. China is the world's largest crude oil importer since 2017. The country imports around 8.4 million barrels a day. China imported around 56 per cent of crude oil from OPEC in 2017 alone. Since Iran is also a part of the OPEC group, fuel prices could see a spike after the US sanctions, which have officially been cast by US President Donald Trump on August 7. Like other European countries, the UK imposes a huge tax on commercial fuel, which makes up for over 70 per cent of the cost of a gallon of gasoline. Petrol is Rs 119.9 per litre (5.91 pound a gallon) while diesel was priced at Rs 121 .8 (6.03 pound per gallon) in London.